We welcome our new Interim Rector, The Rev. Glenn Miller, who began serving St. John’s on Easter Sunday. Fr. Miller is ordained into the Lutheran Church (ELCA) with whom the Episcopal Church is in full communion partnership. Fr. Miller is a native of Harrisburg. He holds a B.A. in Music from the Conservatory at Shenandoah University, and an M.Div. from the Lutheran Theological Seminary at Gettysburg. Fr. Miller began his ordained ministry 32 years ago, serving congregations in York County and Berks County. In 2002, he began a series of institutional calls to ministry, serving as Vice President at the Lutheran Theological Seminary at Philadelphia, Carthage College in Wisconsin and Lutheran Social Services (now SpiriTrust Lutheran) in Pennsylvania. His focus in these positions was in the areas of fundraising and communications. Fr. Miller is delighted to be back in parish ministry for a time, and especially delighted to be at St. John’s. While a Lutheran, Fr. Miller has a longstanding and deep love for the Episcopal church and its liturgical life particularly. In his college years he was a soloist and choirmaster in Episcopal churches. While at Philadelphia Seminary, he worked with the Diocese of Pennsylvania in creating a chair in Anglican Studies. 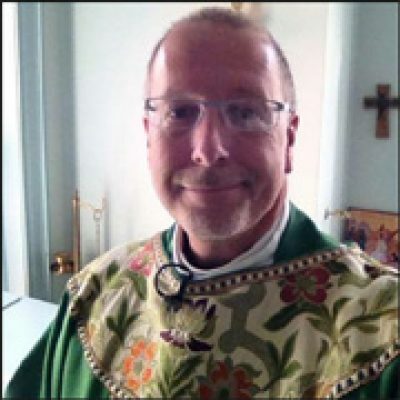 And more recently he served St. John the Baptist Episcopal in York, where he had been a regular worshiper, for three months while they secured an interim rector. Fr. Miller and his wife Carol reside in York. They have two adult children, a son Jason in Houston, TX, and a daughter Sarah in Sydney, Australia.